Well done!! Keep up the good work. You'll reach your goal of a million in no time. Great job!! I enjoy all your post and really like your portfolio very solid companies! SO awesome... I recently just crossed $250K, which was awesome, and have been lucky to stay above that mark for 3 days straight.. looking forward to my "3rd" 100K as well, it's coming quick. Love what compounding and investing early and often does to the portfolio. This is a great achievement YD. You have a great savings rate that has allowed you to build a nice size portfolio in a relatively short amount of time. Great job. Thanks for sharing. That's some pretty impressive growth, and a real testament to the power of savings and compounding. I think you will be on track to meet your foretasted goals assuming no market corrections. Awesome stuff YD. The first $100k really is the hardest. That savings rate is really going to boost you forward now that your portfolio is taking on a life of its own. Congrats on that milestone, YD! Great job! I'm trying to hit my first 100k in my taxable accounts this year. Congratulations, Young Dividend -- this is a great milestone! 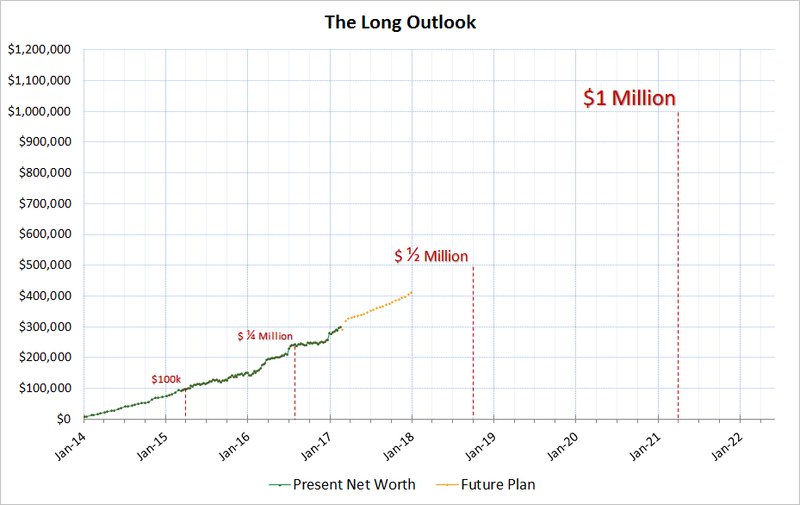 As you mention, the first (and second and now third) $100k will be working for you through compounding and you'll see the next $100k's come much faster. How exciting! AWESOME! Congratulations. How much of the 100 to 200 and then 200 to 300 was growth vs contribution?